Decadent aromas of fresh picked raspberries invigorate while natural exfoliants of Raspberry Seed Powder make this the perfect body polish. Pure cane sugar and nature’s gentle buffers sweep away dry skin while it nourishes and conditions. With a rich, buttery feel it can be used daily to keep skin looking dewy soft and silky smooth. Use in wet or dry room. 1 Gallon. Pure Cane Sugar, Coconut Oil, Beeswax, Pumice, Laureth-3, Silica, Raspberry Seed Powder, Apricot Seeds, Walnut Shell Powder, Almond Meal, Sunflower Oil, Dimethicone, Phenoxethol, IPBC, Manganese Violet-CI77742, Red 7 Lake-CI15850, Fragrance. Biotone Sugar Body Polish - Coconut Crush / 12 oz. 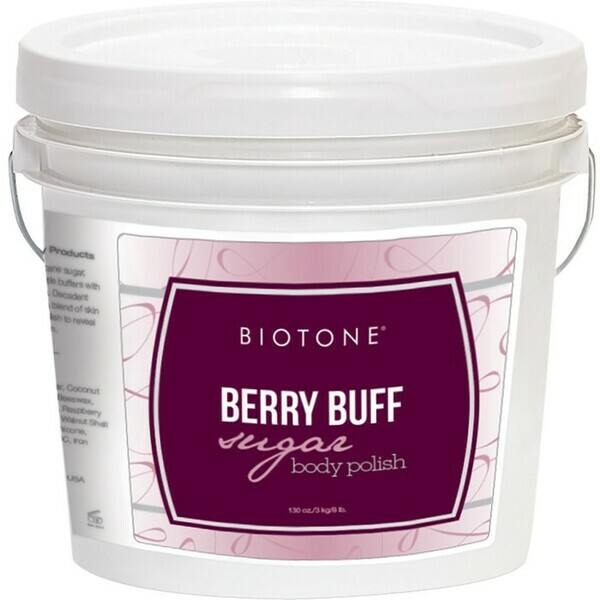 Biotone Sugar Body Polish - Cafe Brulee / 12 oz. Biotone Sugar Body Polish - Berry Buff / 12 oz.